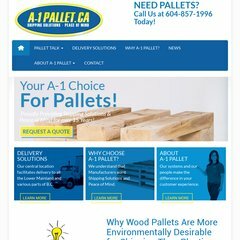 a-1pallet.ca A1 Pallet - Contact Us - Pallets Vancouver | Wood Pallets | Heat ..
a-1pallet.ca A1 Pallet - Glossary - Pallets Vancouver | Wood Pallets | Heat ..
a-1pallet.ca A1 Pallet Terminology - Pallets Vancouver | Wood Pallets | Heat ..
a-1pallet.ca A1 Pallet - Request a Quote - Pallets Vancouver | Wood Pallets ..
ns1.netfirms.com, & ns2.netfirms.com are its DNS Nameservers. Its IP Number is 66.96.160.140. It is hosted by The Endurance International Group Inc (Massachusetts, Burlington,) using Nginx web server. PING www. (66.96.160.140) 56(84) bytes of data.